Has your lamp or light fixture quit working? Are you tempted to buy entirely new lamps just to avoid overly priced lamp repairs? Or do you have a family heirloom piece that has been handed down from generation to generation that you would like to see work again? We can address these issues and more with our high-quality lamp repair services at lighting(one) of Cincinnati. We’re proud to be your trusted source for lighting products and services in Cincinnati. Our experienced lighting professionals have experience fixing everything from antique lamps to modern lamps, and our goal is to provide affordable lighting services to the local community. Contact us today to learn further details about our costs and the specific lamp repair services we offer. At lighting(one) of Cincinnati, we can help fix any issues your lamp might face. We perform all types of repairs, ranging from simple socket replacements to complete re-wiring. Our team only uses UL listed parts, and we ensure your lamp or light fixture is safe for use. Basic repairs start at $35 plus parts depending on the type of repair service necessary for your lamp. 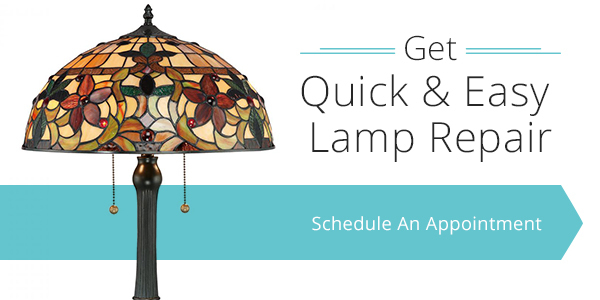 For more advanced repairs, please bring in your lamp or light fixture for a more accurate estimate. If you’re looking to repair your lamp on your own, our lighting experts can help connect you with any necessary parts. How Do I Know If I Need Lamp Repair Services? You can bend the wiring of your lamp and it starts to crack or bend. Any type of insulation is missing near the socket of your lamp. You can see any bare wiring of the lamp. If you don’t address any of these issues with professional repairs, you could have a fire hazard on your hands. If you’re unsure if your lamp could benefit from professional repairs, feel free to contact us with any of your questions. A lot of the times, individuals purchase lamps with faulty or old-school wiring without even knowing it — especially antique lamps that have been around for several decades. These types of lamps have a different structure of wiring that has changed in more modern lamps seen today. 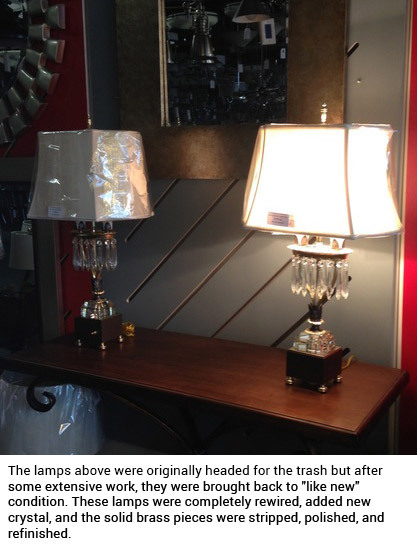 Do you have a lamp in your home or office that you need to have repaired? Don’t throw it away just yet. Our professional team at lighting(one) of Cincinnati can help you preserve your lamps and extend their lifespans — all at an affordable price point. On top of our affordable and trusted lamp repair services, we also provide a large selection of lighting products for you to choose from, ranging from chandeliers to outdoor lights. Visit our 4,000-square-foot lighting showroom in Cincinnati today to see our beautiful and unique lighting selection. Have any questions for our lighting experts regarding our lamp repair services? Call us at (513) 216-5455 or schedule a consultation with one our Lighting Associates for more information.